1965 1966 Edinburgh's Hawkhill Hammers Edinburgh's Davidsons Main Edinburgh's Granton Griffins v Newcastle Vikings 1967 Newcastle at Stockton Newcastle v Halifax Newcastle & South Shields Teams Visit Edinburgh 1968 1969 1970 The Spills! 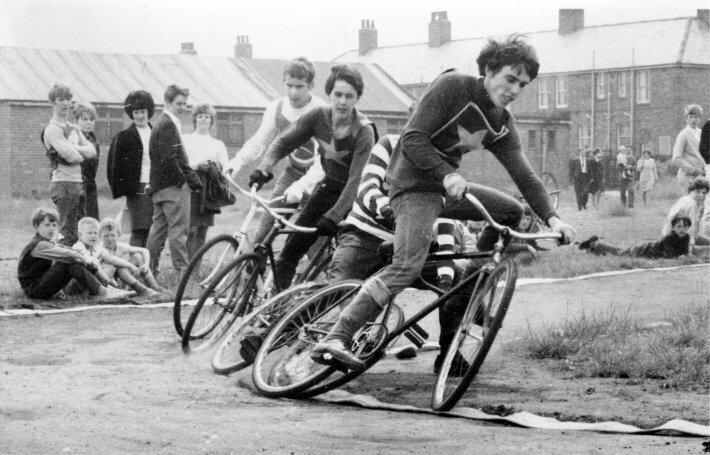 In 1965 cycle speedway in its basic form started again, in Newcastle, South Shields and Middlesbrough.. 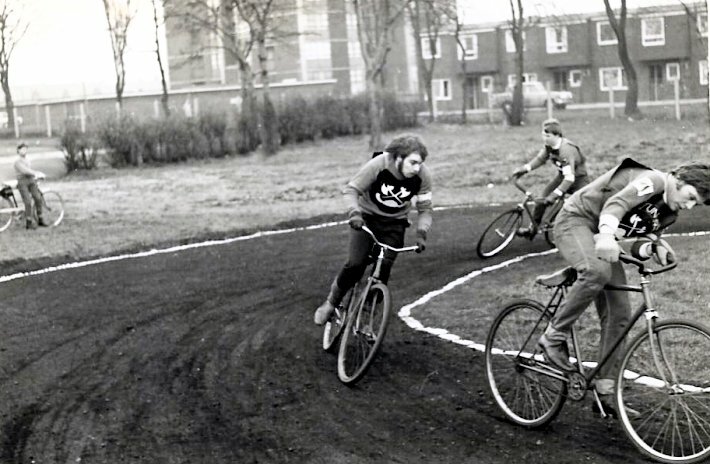 Tracks were basic, as were bikes, however, things would rapidly improve. 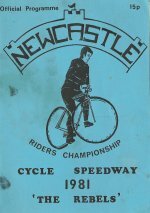 In 1966 Newcastle rode at Middlesbrough, and the first meetings took place between riders from Shields and Newcastle. 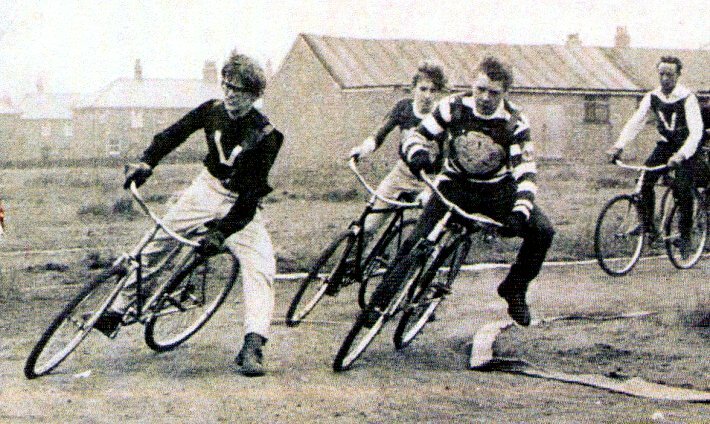 Both teams rode at Edinburgh and Halifax. Throughout the coming years, better tracks were laid and proper organisation came in. 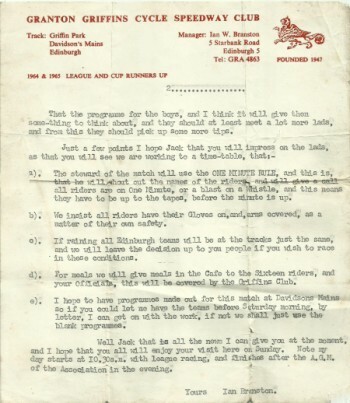 By 1970 Newcastle and Saltersgill Middlesbrough had raced in the Northern League, and visits to Sheffield, Manchester, Glasgow and Birmingham among others had been made by teams and individuals. 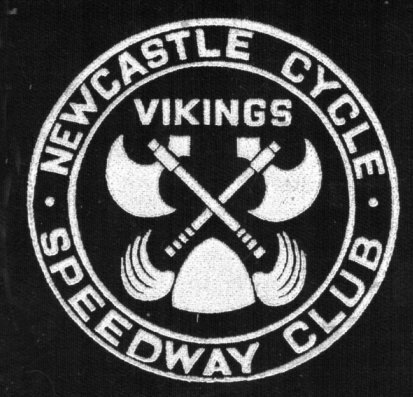 A nucleus of around eight riders were about to become the Newcastle cycle speedway team. 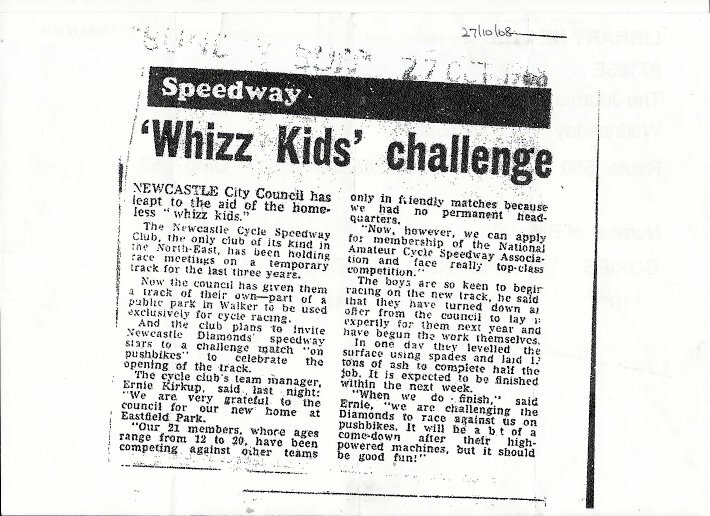 Although at the time it was just "playing speedway" on a patch of grass. 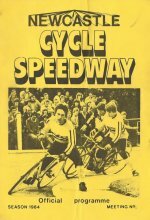 We had no idea there was "proper" cycle speedway around the country, and it was a lot different to what we were doing. 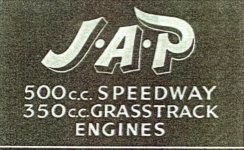 Racing eventually settled at a grassed area surrounded by council houses off Moorland Crescent, about quarter of a mile from Brough Park. The Newcastle pioneers. L-R A shy Norman Carson, A very smart Ray Turner, Keith Dyer with big cow-horns, George Taylor with even bigger cow-horns and Gess Atkinson. Racing between ourselves was the norm in various forms, match races, track record attempts etc. However, all was to change in a matter of months thanks to a lucky coincidence. Kenny Tiffen and Keith Dyer at the state of art starting tapes, under the control of "dapper" Ray Turner. 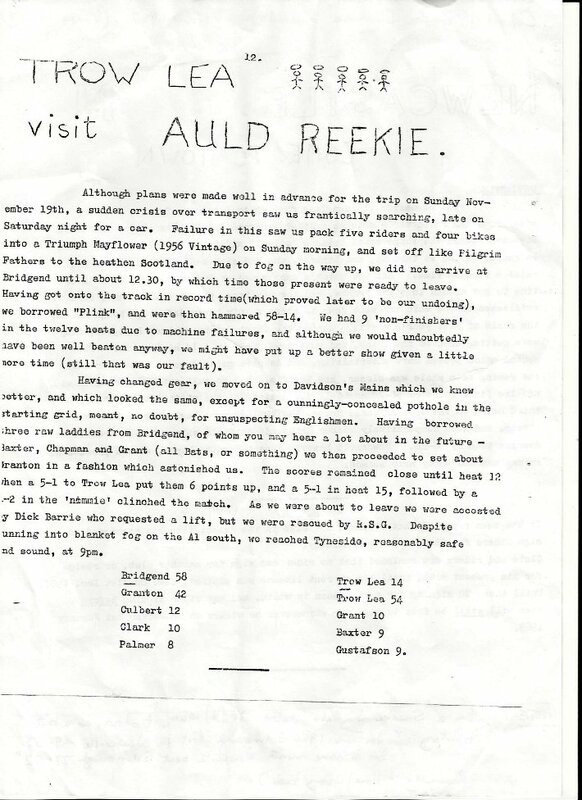 In October 1966 Newcastle and South Shields rode in Edinburgh for the first time. 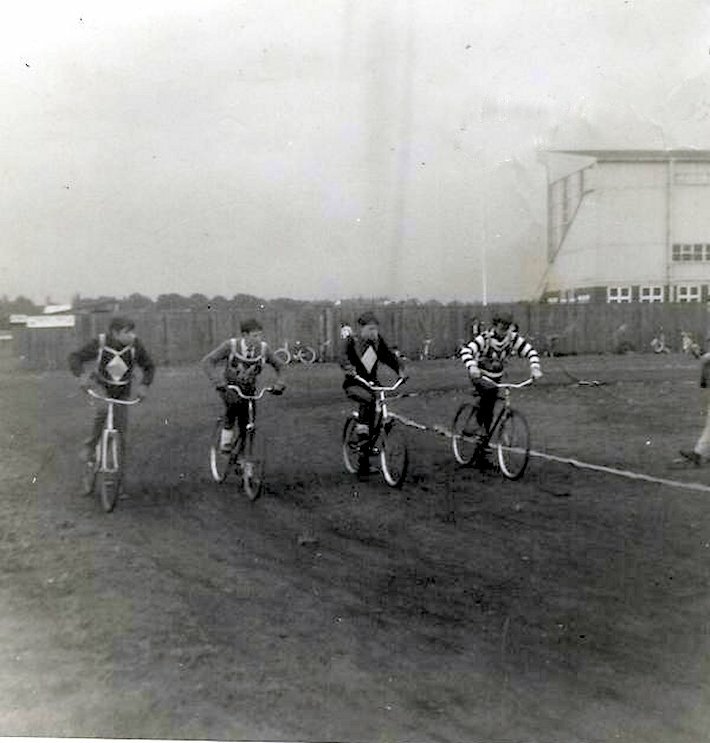 The meetings were arranged by South Shields' Les Gustafson, both teams, bikes and officials were boarded onto a coach hired through the same firm used by the Speedway Supporters Club. We were in for a shock! 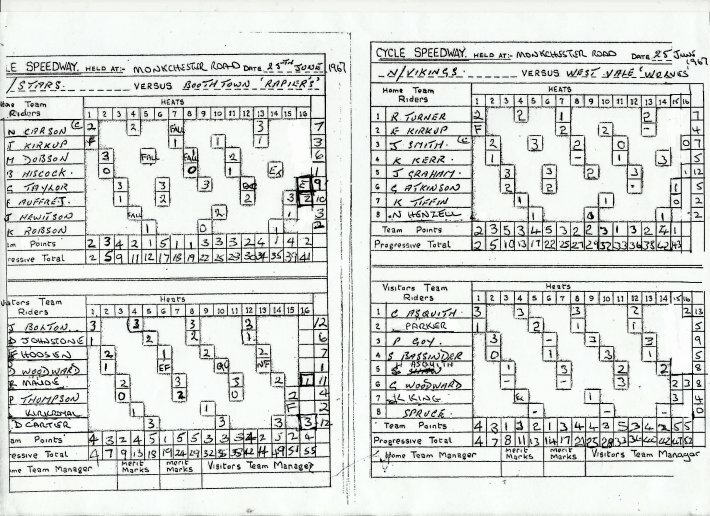 The sport was much more organised than we were used to. Bikes with special gearing, Canadian bends handlebars, rising starting tapes were just some of the surprises. Needless to say we were beaten out of sight, but we were quick learners, and our attitude to racing changed overnight. 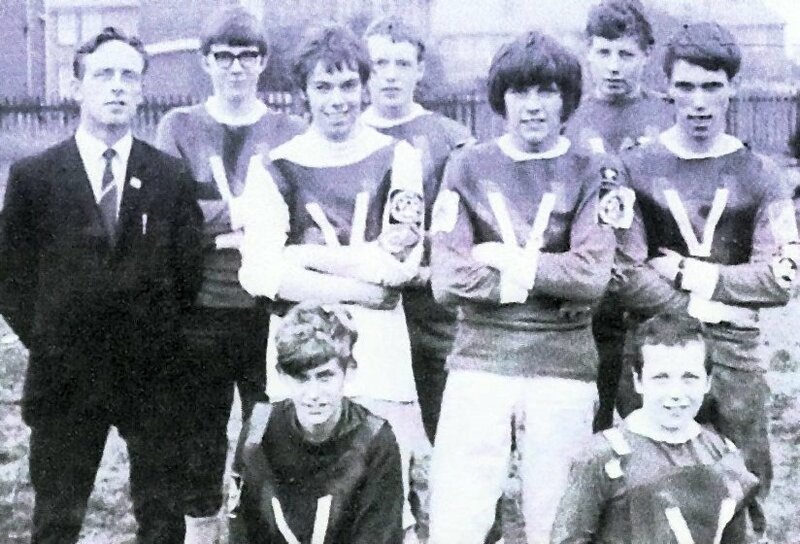 Team photo of Hawkhill Hammers, who hammered Newcastle 78-18 at Pilrig Park. 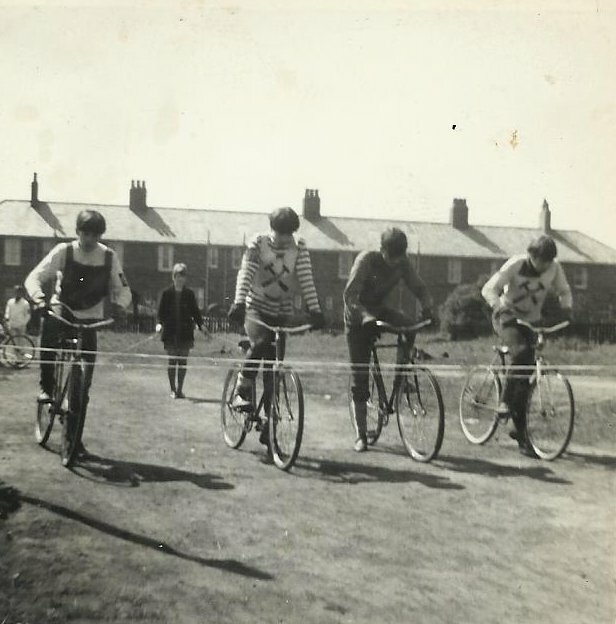 Their team was J Wylie, D Muir, A Dickson, G Watson, A Steel, R Day, W Young and T Skelton. Keith Dyer and Norman Carson looking good, unfortunately the race was for third, with the Hammers pair long gone. 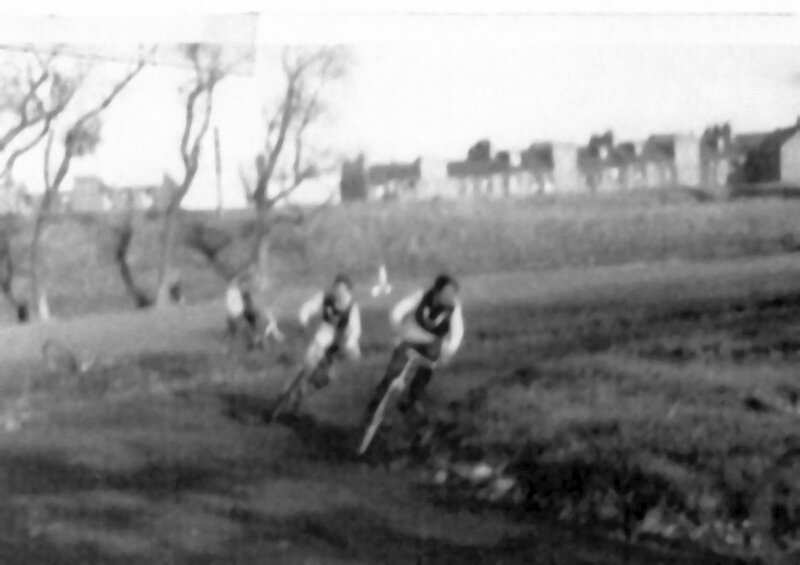 A view of Davidsons Mains track, home of Granton Griffins. This was Edinburgh's best known track. Built in the early 1950s it was the venue for most big meetings in the city.Newcastle raced the Griffins Junior A team and were beaten 65-30. At least there was the satisfaction of a 5-1 from Jim Smith and Ray Turner in heat 2. 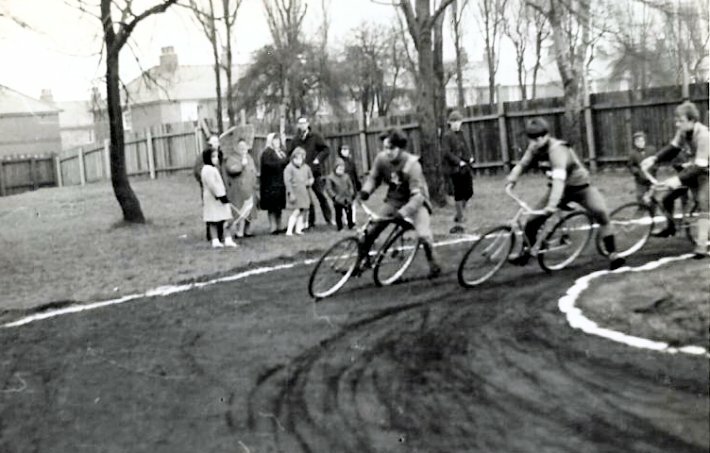 South Shields also raced at Davidsons Mains against Belle Vue and Scottish Rangers at Pilrig Park. 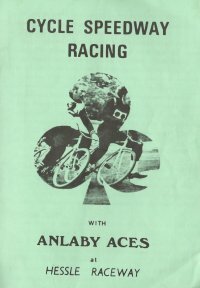 Programme of the 1966 Granton meeting. Maybe we should have ridden against the "B" team. 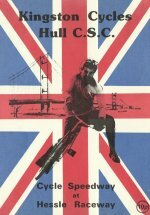 Newcastle and South Shields visited Halifax in 1967. Here are two photos from the meeting at West Vale. Jim Graham leading with Jim Smith in third place. This is a photo of both teams. 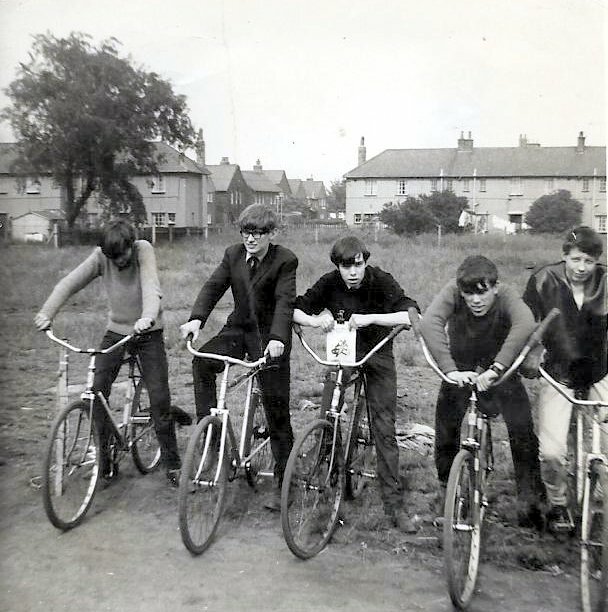 the Newcastle riders from left to right are, Micky Cooney, Gordon Dominy (partly hidden), Jim Graham, Keith Dyer, Bruce Hiscock (with head bowed), George Taylor (with bobble hat), Norman Carson (captain) and Jim Smith. Unfortunately West Vale were much more experienced, and ran out winners 67-29. Jim Graham being the only heat winner. 1967 proved to be a pivotal season. Following the Edinburgh trip in 1966 we decided the only way to improve was to travel and to that end an early visit was arranged to Middlesbrough. Unfortunately collective memories have failed, and the trip remains shrouded in mystery. Luckily some photos have survived. The date and result are unknown. In April another joint trip with South Shields was made to Halifax, Newcastle rode against West Vale (lost 29-67) and Greetland (lost 26.5-69.5), so result wise we were still losing heavily, but gaining experience. Jim Graham as the only heat winner over the two meetings, one at each track. On the 25 June, Halifax returned the favour with 2 meetings against Newcastle and Shields at Monkchester Road. 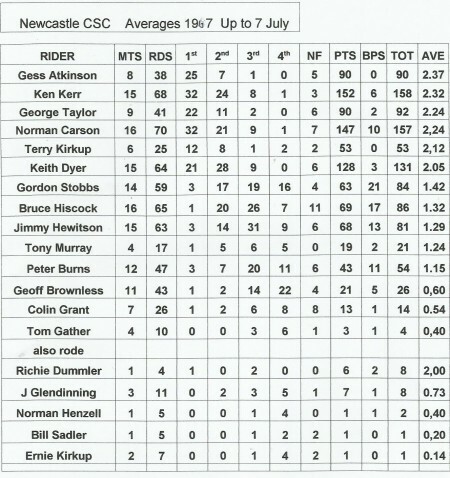 A much better performance took place considering that the Newcastle riders were divided into two teams, allowing the lesser lights to gain experience. The first match was a defeat by Boothtown Rapiers 41-55, followed by a closer match against West Vale, 44-52. 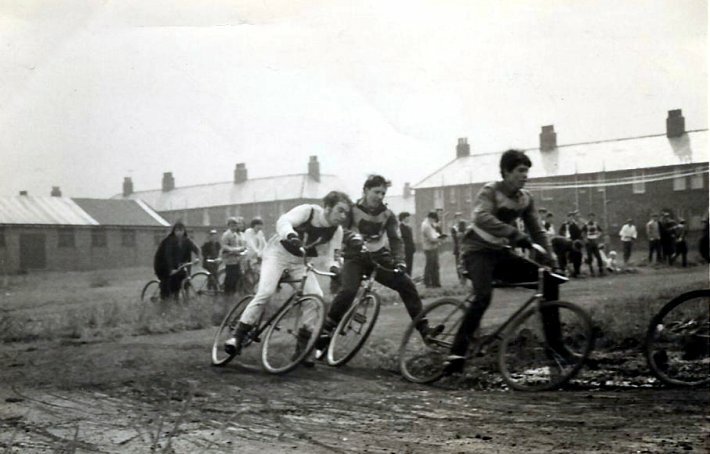 On the local front, Jim Smith and Keith Dyer won the Tyneside pairs at South Shields' new Temple Park track, on the same day, Newcastle riders filled the top 3 positions in the Tyneside Open, won by Jim Graham from Norman Carson and Keith Dyer. Visitor from Teesside, Frank Auffret was the first winner of the Newcastle Open Championship. A coup for us was that the awards were presented by Ivan Mauger, who brought his family to the meeting. 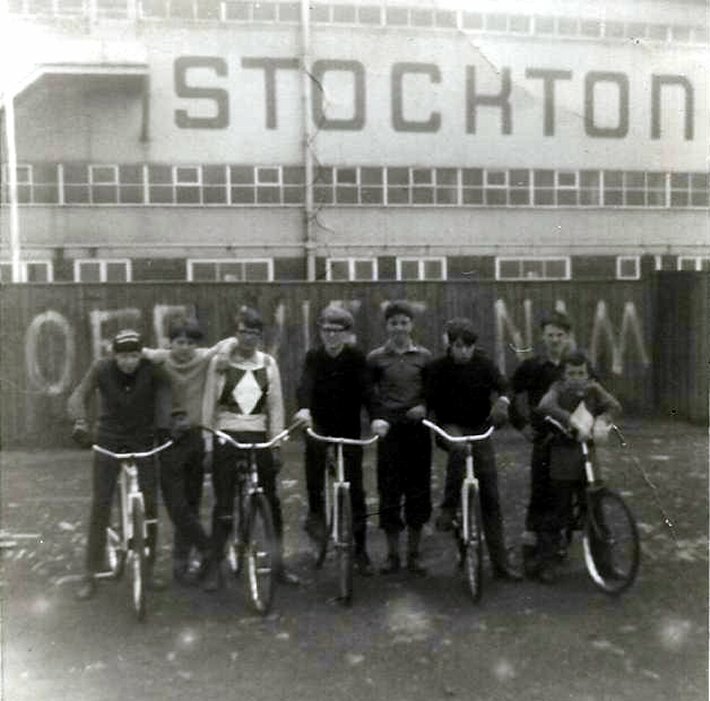 Newcastle team at Stockton Racecourse car park. This appears the only time the team raced with a Diamond's race jacket. 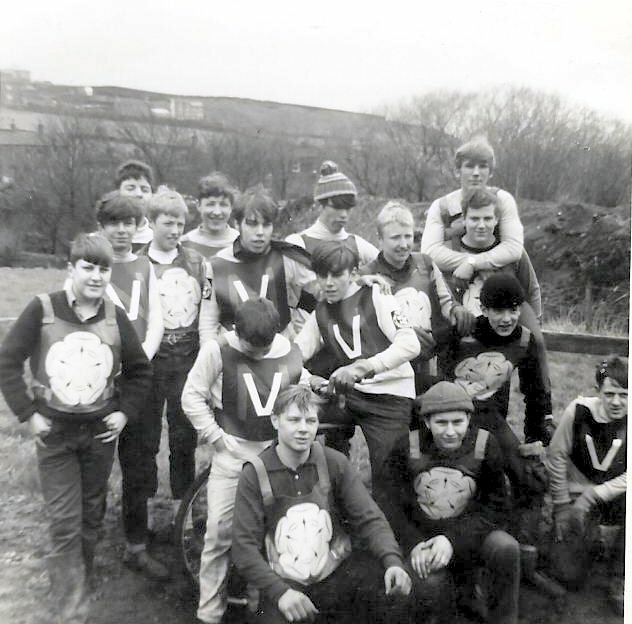 Gess Atkinson, Norman Carson, Micky Dobson (moonlighting from Shields), Ray Turner, Gordon Dominy, Keith Dyer, Jim Smith and Bruce Hiscock. Keith Dyer and Jim Smith at the start. No starting equipment to be seen. In charge is Nigel Furness, office manager at Middlesbrough Speedway. The trip took place "Around October 1967" exact date unknown. 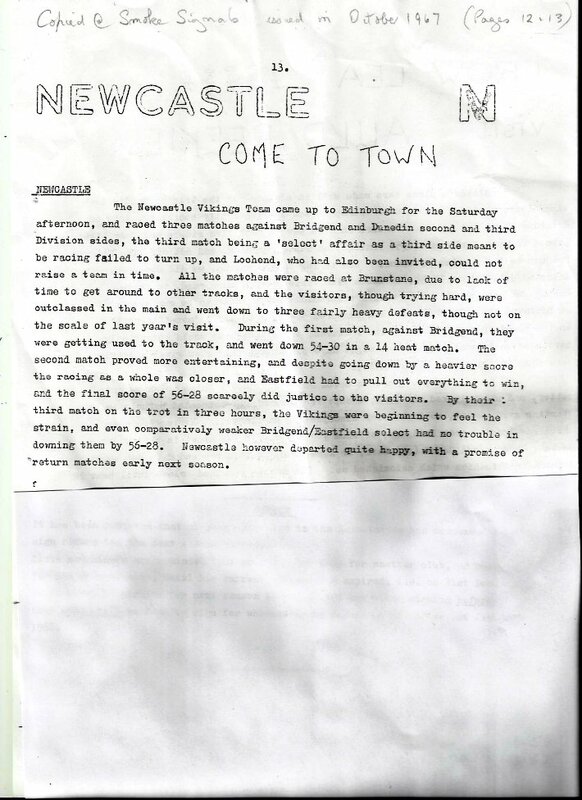 "A contemporary report of the visit of Newcastle and South Shields' visit to Edinburgh around October 1967". Thanks to Alan Douglas for finding it". "I used to keep regular averages around this time. There was a local league with 4 teams and 4 riders. This appears to be only one that has survived. Judging by the amount of riders shown (19) this was a popular time for local riders.. 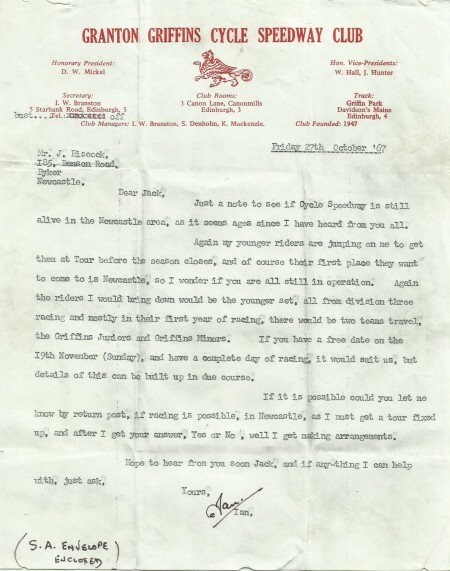 The details below have been taken from the original scrap of paper. (Keith 2017)"
1968 appears to have been a quiet year. From what can be ascertained, only the regular local league and a home meeting with South Shields took place. Fout teams contested the 4 aside league,and new faces were coming through. Mick Hoult, Tony Arrowsmith and Ritchie Dummler would play a major part in coming seasons. The Test Match against Shields was the highlight, and contained enough drama for a full season. A review of the meeting can be found on the Test Match page. The 1968 Newcastle team prior to the start of the meeting against Shields. L-R Ernie Kirkup (team manager), Kenny Kerr, Keith Dyer, Terry Kirkup, Norman Carson, Gess Atkinson, George Taylor, kneeling, Peter Burn, Bruce Hiscock. First bend action from heat 8 on what was a tricky surface. Gess Atkinson (N) out of picture storms to a fine win, while Eddie Murray (SS) holds second. Jim Graham (SS) and Keith Dyer (N) fight for third. The result was a 4-2 for Newcastle with both Graham and Dyer passing Murray. Start of a local league race, were we the first to have a female starter? 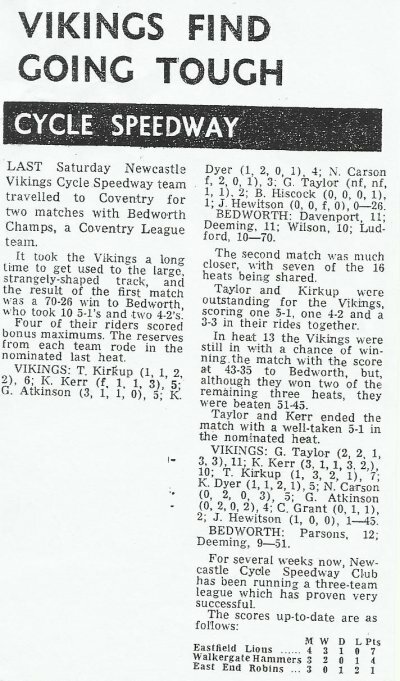 Recently unearthed is the above newspaper cutting which shows the result of two matches ridden at Bedworth (Coventry). It was most likely ridden in 1968. 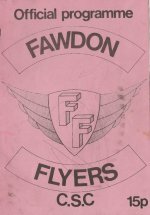 After a quiet 1968, Newcastle rode away meetings in Scotland, Halifax and Manchester, in 1969 and the local league continued, quite a few new riders made their debuts throughout the year. The team also entered the National Team Championship. On April 27 Woodside Diamonds from Halifax were the opposition in the first round of the Nationals held at Eastfield Avenue. A full team put up a magnificent performance and were worthy winners 56-40. The same teams met in a junior match, this time Halifax ran out winners, 47-30. Details of the meetings are shown below. 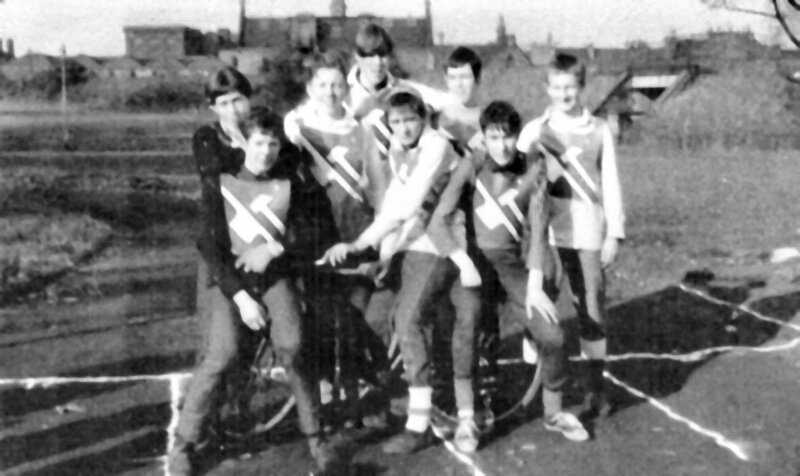 Incidently Pip Serbert who scored 15 points in the junior meeting went on to become the British Champion in 1980. The official referee for this meeting was one of this site's contributors Les Gustafson. I think he is still shell shocked from the experience. The reward for winning was a trip to Edinburgh to meet Liberton Lions. 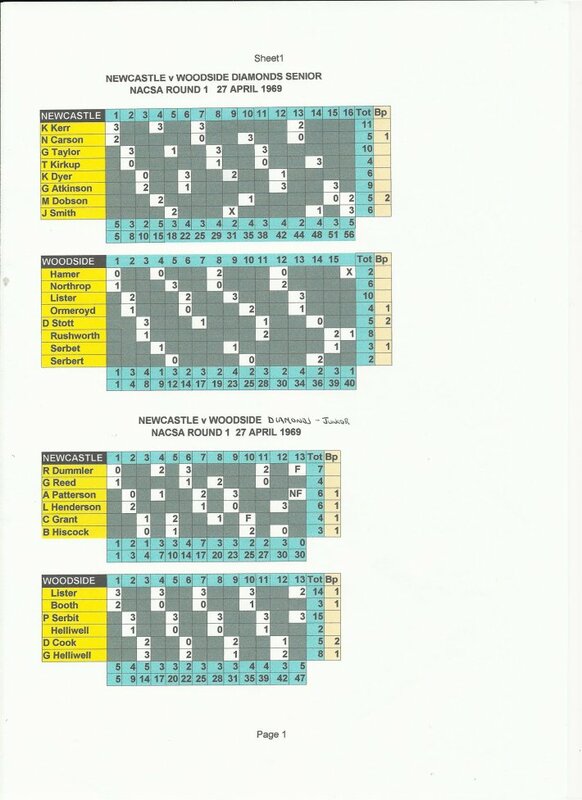 Newcastle started well with a 5-1 from Kerr and Dyer and by heat 6 the scores were level at 18-18. Liberton then moved up a gear and eventually ran out easy winners 59-35. Newcastle scorers, Kerr 7, Taylor 7, Kirkup 6, Smith 6, Arrowsmith 4, Dyer 2, Dobson 2, Atkinson 1. 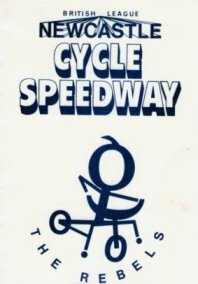 On September 8th Newcastle broke new ground and visited Glasgow, who themselves were rebuilding their cycle speedway base. A senior and junior side rode in four meetings at Hampden and Kingsway. The senior team won both matches easily ( the first wins on foreign soil ), and the inexperienced juniors lost both in last heat deciders. 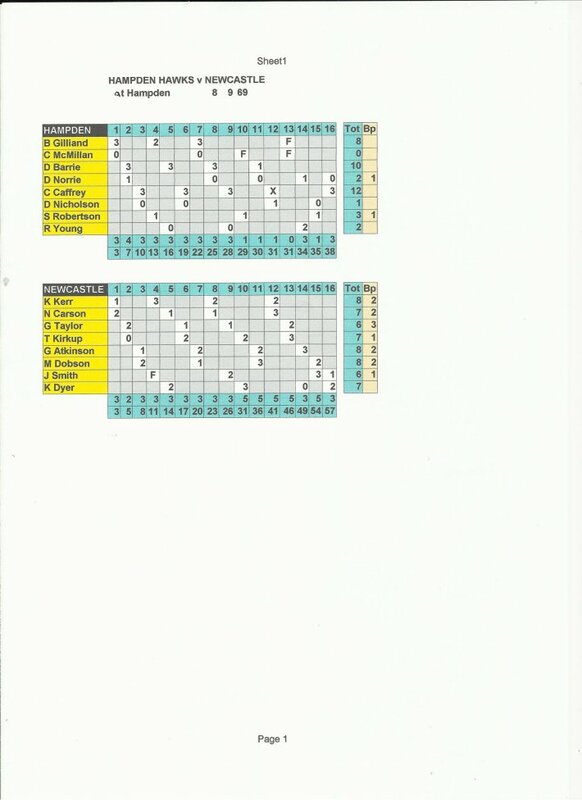 6 riders took part in NASCA qualifying round at Woodside Halifax. Jimmy Graham (11) and Norman Carson (9) qualified for the next round as did Frank Auffret (12) of Teesside. Dobson, Dummler, Kerr and Kirkup failed to qualify. 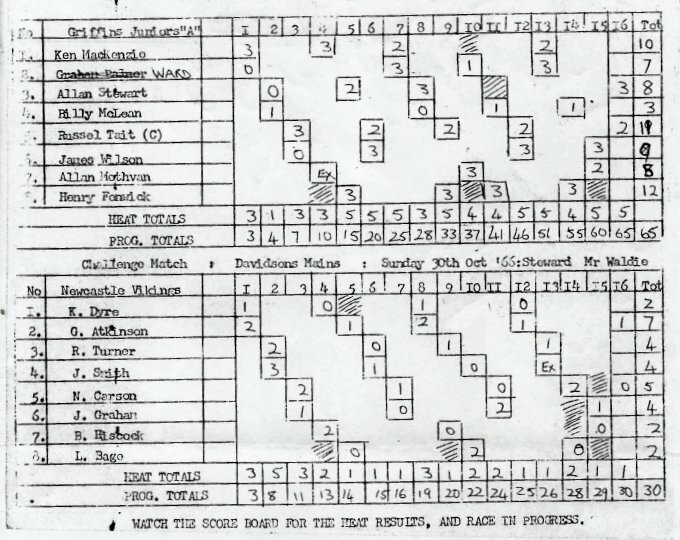 Meetings were also held in Halifax, Newcastle losing heavily 26-70, and Manchester losing 42-52 to Manchester select team. 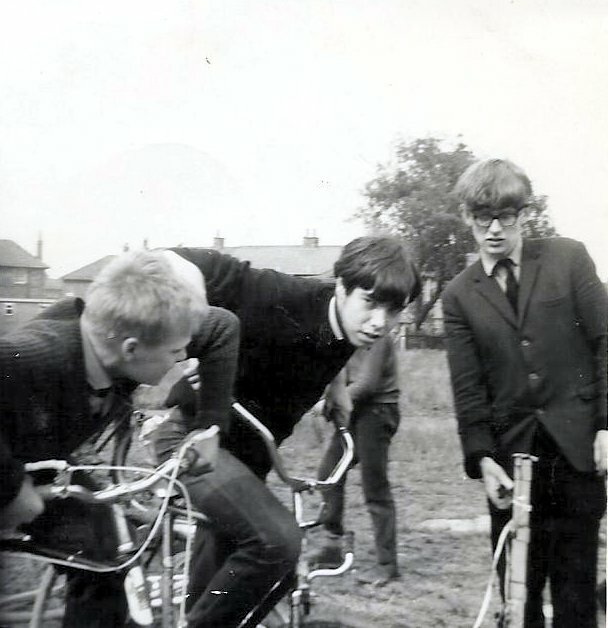 At the end of 1968 the decision to move from Monkchester Road was made. The new track on land made available by the local council and was situated in Eastfield Park. 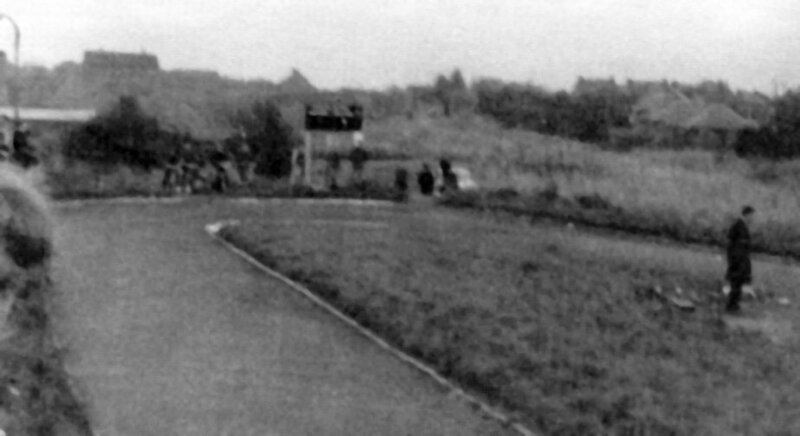 The track was situated on Stotts Road, just along from the bottom of the Fossway, about a mile south of Brough Park. An article from the local press is shown below. Unfortunately the proposed match never took place. Also shown are two photos from the new track. 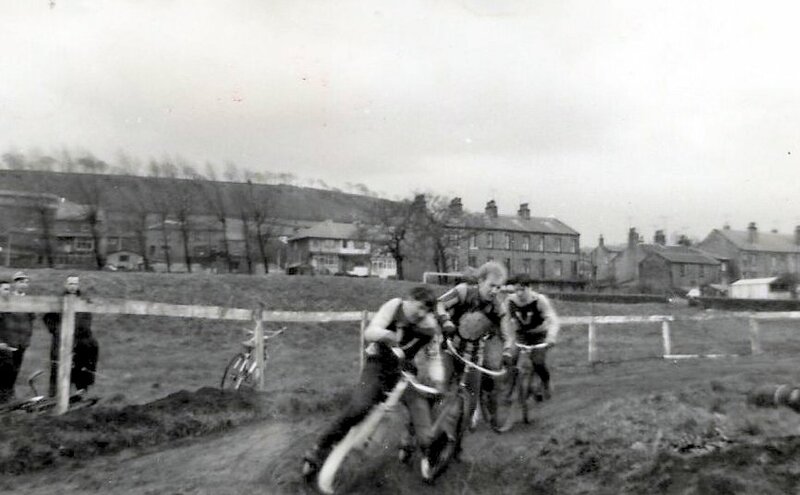 Norman Carson leads Keith Dyer and Colin Grant at Eastfield. Frank Auffret (Middlesbrough) in front of Tony Arrowsmith (Newcastle) and R Burrows (Middlesbrough). After a successful 1969, hopes were high for the start of the new decade. 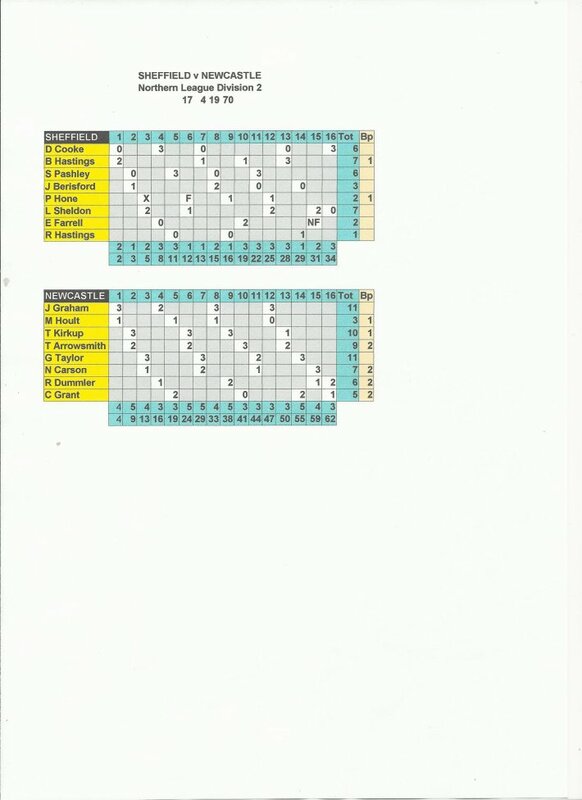 The team entered the Northern Premier League Division 2, along with Teesside, Ivy House (Halifax), Parkwood (Sheffield), Sheffield, Denton (Manchester) and Leicester "B". Had the league continued it is possible Newcastle could have been challenging, as they had made a strong start. *See above - revised result 47-42. Newcastle trailed by one point prior to the last heat, but a magnificent 4-2 from Graham and Taylor secured a narrow one point victory. Auffret 12, Tilley 9, McQuade 4, Forth 2, Bell 1, Burrows 0. A NACSA team championship meeting was ridden in Edinburgh, with Newcastle going down to local team Shields 40-56. Also ridden was a NACSA individual qualifying round held at Eastfield Park. The meeting was a triumph for the visiting Edinburgh riders with T Low (14), J Murphy (13), G Potter (13), J Tait (12) and S Baxter (11) leading the qualifiers. Newcastle filled the final three places with George Taylor with 11, Terry Kirkup with 9 and Mick Hoult 8 defeating Richie Dummler in a run-off. Non-qualifiers were Dummler, Patterson, Grant, Hiscock, Robson, and Dyer (my last meeting and only 1 point to show). 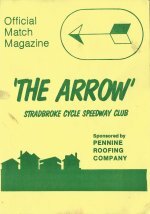 Programme from the Newcastle v Sheffield meeting. Jack Hiscock, Newcastle Team Manager (and Fifties rider), kneels to tend to his son Bruce. Bruce sadly passed away at a relatively young age. 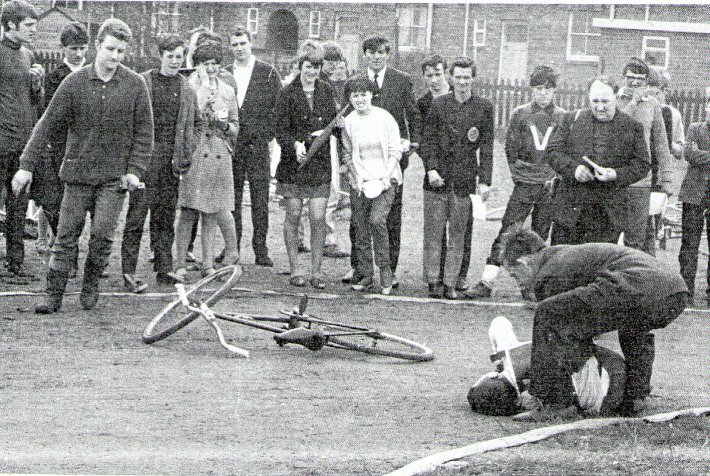 The spectators look on with concern (the photo is a who's who of Tyneside Cycle Speedway personnel of the mid-Sixties). George English's dad also called George English is 4th from the right. So that was it, 1970, a season that had started brightly, fizzled out, and the tapes would not rise again until 1978. Copyright © 2011 Keith Dyer. All rights reserved. Advertisers/sponsors welcome on this site. email for the price.